She was born on August 18, 2 hours after I felt the first weak pain on my bed. It was so quick and easy delivery! Now I'm busy with her so I cannot post for a while. But we both are very happy and doing well. Thank you very much for you all! See you (* v *)!!!! Congratulations! Enjoy your new baby! also...2 hours??? Wow, that's almost a miracle, I think! She is adorable. Make sure that you continue to take care of yourself as well. I just started reading your blog. Oh, she is absolutely gorgeous! Congratulations on your beautiful little tomato! She is so beautiful!!! Congratulations! She is so ADORABLE! My mom and I are very happy for you! Such a beautiful girl! Congratulations!! I am so very happy for you, and keep thinking of your precious little one wearing all the beautiful things you made for her! Congratulations!!! Thank you for sharing your happy news! Congratulations! she is beautiful, the most beautiful little tomato ever. So very glad to hear that you are all doing well! Oh, congratulations!! What a wonderful (speedy) delivery and beautiful baby. I wish you and your husband great JOY with this little one!! Rest and eat well and most of all ENJOY your baby! She is so beautiful. Congratulations. Enjoy every minute, they grow so fast. And take good care of yourself. Congratulations, Mai! She's beautiful. What's her name? She is absolutely beautiful. I'm so glad the delivery was a fast one for you. Take good care, Lucky baby, lucky mommy and daddy! Enjoy each other. Congratulations! She's beautiful. :0] Glad to hear that you're all doing well. I love your blog! Congratulations to you both :)) she is so sweet! She's so beautiful. Congratulations to you and Haru. Oh my, what a beautiful face. So glad your delivery was so quick. She is lucky to have such a creative mommy. Enjoy the 'tiny time'. From my experience, they grow way too fast. Ohhhhhhhhhhhh!!! She is sooooo beautiful!!!! She is so beautiful! Enyoy. HOORAY!!!! congratulations! I have been waiting for this post with great anticipation! enjoy her - she is beautiful! Congratulations! Lucky you, lucky father and lucky daughter! 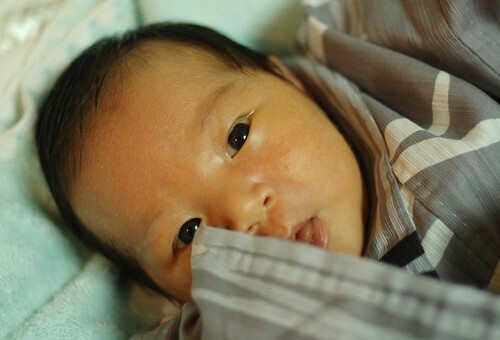 Congrats~~~she's such a cute baby! Congratulations on your very beautiful tomato! So happy to hear that you are all doing well. Congratulations and welcome to your little one. I remember reading your blog months ago when you announced that you were pregnant and now she's here! Congratulations! What's her name? Is it the word for tomato in Japanese? Once again, congratulations! Enjoy your new life together! Congratulations to you, she is very beautiful. Congratulations! How beautiful she is! Take good care and enjoy!!! Oh, such a beautiful angel. I am so glad everything went well! I wish you both much fun and happiness, congratulations! I'm so happy that you are both well! Your tomato is just beautiful!!! Every happiness in the world to the little angel and her parents!! Congratulations on your beautiful daughter! All the best for you and your family. Felicitations from France! She looks just as gorgeous as all your creations. Here's a very good news !! CONGRATULATIONS !! She is ssoooo cute !!!! She is beautiful, congratulations to you both. What a beauty! Enjoy this wonderful time of your life. you will make a great mom. congratulations! Congratulations! She is so beautiful. Enjoy, enjoy, enjoy!! Thank you for taking the time to post her photo. How wonderful! So happy for you all. I'm glad you are all well. She's a beautiful little lady. Hoo hoo welcome dear beautiful baby girl. Congratulations! She is beautiful. I'm so very very happy for you. Looking forward to watching her grow and wear and use all the lovely things you have made for her. Olá, seu bebê é muito lindo!!! Parabéns, daqui do sul do Brasil! Congratulations and blessings to you both. Omedetou Gozaimasu! I am SO happy for you that your delivery was so quick and easy! And what an absolutely, beautiful little girl you have! I know we all look forward to watching her grow through your blog! Thank you for sharing with us you joyous news! God Bless you and your family! Congratulations!! She is very cute. Congratulations to all three of you! What a wonderful adventure you're on now! Enjoy your time with her so little, they grow up so quickly and soon you'll have her in school. My son is turning 10 soon and my daughter just turned three and I'm not sure where all that time went! Congratulations! I'm very excited for you. Enjoy every minute with your beautiful little girl. How wonderful. She is beautiful. Congratulations to you and your husband. What a cutie!! Congratulations! Enjoy your first moments with the lovely princess! What a sweet baby! Congratulations! Aw, she is so cute! Congratulation to both of you and your husband! Hope to see more Little Tomato pictures.. So happy for you and your husband Mairuru, your daughter is so beautiful. Thanks so much for the photo. Congratulations and all the best wishes!! Oh, she is lovely. Congratulations! May she have a long and happy life! Congratulations, Mai, she is gorgeous! I can't wait to see more stuff you will be making for her. Congratulations to all 3 of you! She is beautiful. And lucky you for the 2 hours part :o) Enjoy that sweet baby. Congratulations ! Bienvenue, jolie petite tomate ! CONGRATULATIONS! SHE IS BEAUTIFUL!!! HOW GLAD I AM!!! Kisses, kisses for you and for her and congratulations to the father too!!! Congratulations to you Mai and your husband !!! Congratulations! I'm so happy to hear your beautiful little tomato has arrived - and what an easy delivery! Can't wait until things settle down for all of you and you can once again start posting. Can't wait to see pictures of her with all the beautiful things you made for her. Congratulations to you and your husband. Your tomato is beautiful! Best wishes to you all! Children are so fun - congratulations! Congratulation! This is the most beautiful tomato I've seen this summer! I am glad you are all doing well! Congratulations to you and your husband! She is so cute baby! And... Her birthday is the same as me! I never forget her birthday. I hope you get lots of rest and take care of yourself. I've been checking your blog everyday for the last month and I said to myself: today, I'm sure Mai will post about the baby! And you did!!! CONGRATULATIONS for your baby girl, enjoy every single second... they grow so fast! Wow, 2 hours.. that's a record! Rest, eat well and try to sleep while she naps! Congratulations!!!!!!!!!! Tomato is beautiful. You and she and your husband must be having so much fun! Congratulations! Take your time, these years never come back. She is so beautiful, I am so happy for you Mai!!! Wishing you and your baby and husband all the best and so much happiness! CONGRATULATIONS ! ! ! ! ! ! ! ! ! ! I have been waiting to hear that news :) I am soooo happy for You And Your husband. Enjoy every minute of parenthood! ! Your daughter is the life's greatest gift! ! ! She is a beautiful tomato, the prettiest thing you've ever made. I am so happy for you! she is beautiful, congratulations ! Yay! Congratulations and good job! She's beautiful! She is gorgeous!!! Congratulations and the best wishes for the three of you now. Congratulations!!! You have a very nice baby. Congratulations! How pretty she is! She is so beautiful and she is going to be the best dressed baby around! Congratulations to you and your husband! Congratulations for the arrival of your bundle of joy...I'm very happy for you! She's beauriful! Congratulations on your sweet babe, she's beautiful!! Omedeto! Sugoku kawaii akachan desu! Ganbate kudasai! I'm happy for your family! From Italy...congratulations. We are wating for some new photo. Welcome to Tomato from Italy!! Such a cutie!!!! Congratulations to you!!! She is soo precious!! Congratz sweet lovely Mai!! So happy for the both of you! Have a lovely merry happy weekend and love to you! So cute baby ! Congratulations ! Congratulations to you and your husband! What a beautiful baby. Good to know you three are doing great. Congratulations on your new sweet child and be well! Hooray! I am very happy for you! Welcome to the world, little Tomato. May all your days be happy and long. Hola Mairuru.... es maravilloso!! !, muchas felicidades, soy asidua a tu blog, me encantan tus trabajos tan hermosos y creativos, ahora a disfrutar de tu lindo bebe =)...saludos desde México. Congratulations! Your Tomato is adorable! Well done on the easy birth. I wish your lovely family much happiness. What a lucky little Tomato to have such a wonderful Mum! And thank you so much for a truly inspirational blog. Look forward to reading more in the future. Enjoy! Your tomato is very very cute. Take a rest and wish next time seeing her again. I'm sure you both are now very happy. I have been waiting for this news too. Congratulations Mai. Welcome to new adventures :). She is very beautiful, enjoy these early days of motherhood! Congratulations. Hope both of you are healthy. She is lovely! A huge congratulations to you! She is adorable! I've been checking everyday to hear the news and am so happy that Tomato has arrived and that you are all well. Congratulations to you and your husband!! Congratulations!! ^__^ She's adorable ! Enjoy your time with her. yay. so sweet. thank you for posting a picture. i love your blog and look forward to more about 'tomato' and your life. Congratulations to you and your family. Your daughter is beautiful. Can't wait to see pictures of her in all her beautiful handmade things. Oh congratulations Mai she is so very beautiful! So ill always remember ur daughter birthday...........what have you named her? Ahh!! Your tomato was born on my birthday! Mai, I'm so happy for you. She's beautiful. Congratulations to you all! She's so adorable!! Congrats to all of you!!! Congratulations! What a beautiful little girl. And what a lucky girl to have a parent like you! Congratulations!! She is SO cute! Congratulations! How lovely! All the best for you all! Congratulations! Very happy for you and your family. Congratulations on your baby girl! She looks so adorable with her curious eyes. Congratulations to both you and your husband. She is adorable! Congratulations! August 18th is also my birthday. I turned 50 this year and my husband surprised me with a wonderful, small party of friends and family. What a beautiful daughter you have. My first born is having our first grandchild in Dec.